Isn’t it amazing to see how far technology has come over the years? Look at your cellphone, then look back at what you had 10 years ago. If you did have a mobile phone, it did little more than simply place and receive calls. Now it can do more functions than your PC, PDA, and another dozen devices combined. Unfortunately, what it still can’t do is survive a quick dunk in the pool. Sure, there are watertight cases, but those tend to impede your ability to do things like listen to music, because the speakers are covered. What you need is a large, portable, waterproof speaker. The ECOROX is a portable Bluetooth speaker that can not only survive a quick dip in the pool, it can hang out in there, blasting your favorite tunes for hours. 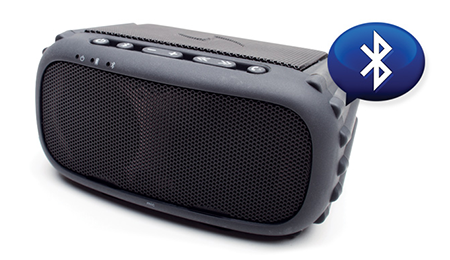 This set of 6 watt stereo speakers is housed in a waterproof body, and designed to float beside you. Just pair it with your smartphone sitting safely away from the water, and you can rock out to your favorite tunes without any risk. You’ll even be able to take calls at the press of a button, so you never miss a call. If swimming isn’t your thing, and you’re more of a biker, this device works for you, too. The ECOROX was designed to be mounted to the handlebars of a bike. Never again will you have to worry about the elements harming your speakers. Of course, you’ll still have to worry about upsetting the people around you, if your music is up too loud as you ride past. You’re going to get 10 hours of talk or playtime out of each 2.5 hour charge. Recharging is handled by a micro-USB cable, and a standard 3.5mm jack offers compatibility with virtually any audio device. You can purchase your own in black, red, or orange for just $130. You can find a handlebar or suction cup mount on the site for just $10 each, as well.